but an anti-art movement, a radical cultural revolution, as a response to World War I ! Dada supported all types of misunderstandings and confusions; as a principle, out of a mood, as a fundamental opposition! Dada reaped the confusion, which it sowed. Dada 1) derived from conversations with the Rumanians Tzara and Janco, who have often used ‘da, da’ (‘yes, yes’); 2) from Ball and Huelsenbeck, when they arbitrarily pointed with a knife at the term Dada (French: hobby-horse) in a german-french dictionary. Dada did not have homogeneous and formal characteristics as other art-styles. Based on common ethics of art, through various places and people, new individual forms of expressions arose. Dada grew out of the Cabaret Voltaire in Zürich. There met, as a result of the outbreak of World War I, emigrants from various countries. 1915 Hugo Ball and Emmy Hennings from München, Tristan Tzara and Marcel Janco from Rumania as well as Richard Huelsenbeck from Berlin and the alsacien Hans Arp, who lived since a view years in Weggis near Luzern. A year later Sophie Taeuber, Hans Richter, Christian Schad and Walter Serner joined the group. Tristan Tzara wrote 1922 a chronicle about Zürich-Dada. In New York the Dada movement was concentrated at Alfred Stieglitz’s gallery ‘291’. Dada activities were made by Man Ray and Marcel Duchamp. Duchamp was with his ‘ready-mades’ a precursor of Dada’s ‘anti-art’. Francis Picabia arising from Barcelona, was the traveling mediator between Barcelona, New York, Zürich and Paris. Dependent on the present abode he published his Dada-periodical ‘391’ from 1917 until 1924 in these cities. In 1917 Richard Huelsenbeck moved from Zürich to Berlin and met there Franz Jung, Wieland Herzfelde and his brother John Heartfield. Additional ‘Club Dada’ members were Johannes Baader, George Grosz, Hannah Hoech, Walter Mehring and Raoul Hausmann. Dada Berlin was, dependent on the actual situation in this city, more political than the other Dada-groups. The Berlin group provoked the society with magazines as ‘Club Dada’, ‘Der Dada’ and ‘Dada Almanach’ containing photomontages, manifestos and Grosz’s anti-bourgeois caricatures. The montage-technique became the main-instrument for the works of the Berlin dadaists. The expert of photomontages was John Heartfield, also called ‘dada-monteur’! This special style has been copied years later by the lettrists and also by the punk-protagonists for their fanzines and record-covers! Dada Hannover was one person: Kurt Schwitters! He was an artist, graphic-designer, typographer and poet who moved to Hannover after completing his studies at the Berlin Akademie. Schwitters started his own specific dada-character, which he called ‘Merz’. He searched for a name for his work and found it in one of his glued pictures. It was a part of an advertisement of the ‘ComMERZ- & Privat- Bank Hannover’. Schwitters had contact to dadaists in Berlin (Hoech, Hausmann) and Zürich (Arp, Tzara). He published the magazine MERZ and the poem-book ‘Anna Blume’ with love-hymns and a print-run of 13’000 ! Schwitters erected the ‘Merz-build’, a three-dimensional constructivist room in his house. A copy (the original was destroyed in World War II) of it can be entered in the Sprengel-Museum in Hannover. Through his attention for the abstraction he got in contact to the constructivists, especially to El Lissitzky and Theo van Doesburg. With him Schwitters organized various dadaist actions in the Netherlands. Theo van Doesburg, the founder of De Stijl wrote under two pseudonyms (I.K. Bonset, Aldo Camini) also dada-poems. Dada Köln was mainly Max Ernst, Johannes Baargeld and Hans Arp. In 1919 Arp moved from Zürich to Köln and after his arrival they founded the dada group. They collaborated in collages, magazines and exhibitions. 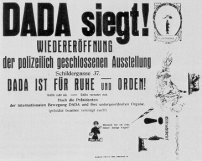 In April 1920 a dada-exhibition in the ‘Brauhaus Winter’ was closed by the police as an offence against morality, because the visitors had to enter through the urinal of the ‘Brauhaus’! In 1920 Max Ernst exhibited for the first time – invited by Andre Breton – his collages in Paris. Then in 1922 he moved to Paris and had a strong influence on the sub-dadaists. Ernst took an active part in the founding of surrealism and became one of the leading surrealist painters. Since 1917 Tristan Tzara had contact from Zürich to writers in Paris. Andre Breton, Louis Aragon a.o. wrote for Dada 4/5. In January 1920 Tzara moved to Paris and met Picabia and Breton, publisher of the magazine ‘Littérature’, there. In the same year Hans Arp and 1921 Max Ernst from Köln as well as Man Ray from New York arrived. Paris became the last important dada-centre. Other members of Paris-Dada were Marcel Duchamp, Jean Croti, Suzanne Duchamp, Jaques Rigaut, Paul Eluard, Georges Ribemont-Dessaignes, Benjamin Péret and Théodore Fraenkel. 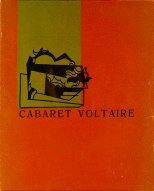 The literary character of the Paris dadaism was formed by Breton’s ‘Littérature’, Tzara’s ‘Dada’, Picabia’s ‘391’ and ‘Cannibale’, Eluard’s ‘Proverbe’ and all together ‘Le coeur à barbe’! The magazines showed also the various interests. Picabia and Tzara dissolved the typography into its linguistical and optical relations as the constructivists. Breton and Soupault worked for a new art-form based on the subconscious, called surrealism. The disputes about the right way and Breton’s try to built a new movement broke off their collaborations. The last dada-season was at the end.